I bought this vehicle as a replacement for my Audi A4. It has excellent interior space and plenty of seats for the whole family. The truck has a smooth, solid ride and is very reliable. These trucks can easily make it to 200k miles with routine maintenance. If I could change one thing, it would be the fuel economy. That being said, what do you expect from a vehicle of this size. If you have a large family like me, it’s either this truck or a Honda Odyssey. The thought of going through the stress and hassle of purchasing a vehicle can sometimes be overwhelming. After visiting several dealerships over a number of days, I was exhausted, frustrated, and mentally depleted. I entered Mac Haik Ford with an attitude and expected to encounter the typical salesperson, with the same disposition, spewing the same jargon as his/her predecessors. I was pleasantly surprised and almost taken aback. ???Doc??? greeted my wife and I in the parking lot. He was very engaging and full of energy and promised someone would be out to assist as soon as possible. Only a couple of minutes passed before Isaac introduced himself. I was ready for the sales spill but it didn?? ?t come. Isaac begin qualifying our needs by asking questions, detailed questions. This was my first glimpse that this was going to be a very different situation that what I was accustomed to. After a few minutes he stated out of the 150+ vehicles on his lot he had 3 that may fit our needs. (He knew the inventory.) Instead of dragging us around from vehicle to vehicle, he had us drive a truck with an engine he thought we needed, then took us to a truck to show us the features he thought we needed. When we confirmed his assumptions, he left to go find the truck he thought we needed. (We purchased this vehicle) Negotiations were simplistic. (The listed price was the lowest we found) Trade allowance was fair (we found a vehicle similar to ours listed online for the same price we were given for our trade allowance). Isaac was very professional, well spoken, and very knowledgeable. I felt like I was dealing with a vehicle placement advocate instead of a commissioned salesperson. I left the dealership with a thorough knowledge of the vehicle, the ability to navigate its intricate operations, and peace of mind knowing he would be around after the sale. (The ???training??? class, which lasted for at least 45 minutes, was held after the paperwork was signed, which is normally when other salespeople disappear. The finance guy was excellent (although Ford?? ?s interest rate to obtain one the rebates was higher than what I am accustomed to paying). This was the best experience I?? ?ve had purchasing a vehicle and I will definitely recommend this dealership to my friends, family, and anyone else who asks. This car has great towing capacity. There are only really two SUVs that can tow over 9000 lbs, The Ford Expedition and the Nissan Armada. I was looking at both closely, just happened to find a better deal on the Ford. Also the Ford has air conditioned leather seats, so win! Brought in my 2014 Denali Yukon to trade for a new body style gmc. Found what I was looking for and they fixed all the issues I had with the vehicle. There was just one thing there were a lot of little things. Taillight, sunroof, headliner, interior carpet and a few other things. They were all addressed without any questions. They had the car more than a few days for the fixes and loaned me a car for the wife and kids while it was there. Very happy with salesmanship and service. Top notch! Will purchase again when I’m ready for a new truck. Wanted a better tow vehicle for my RV trailer but didn't want a pickup. Factory tow package rates ability to tow up to 9000 lbs. Car is very spacious, great interior, it surpassed our expectations on style and performance. Great for long road trips. 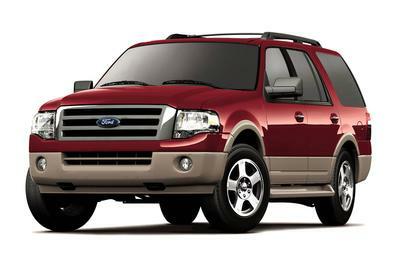 I love my Ford Expedition !! This vehicle meets all of my needs and wants. I now have plenty of space for my family and my dog. Everyone is telling me that this vehicle will last forever.